You’ve probably heard us talk a lot about the ARTAS® system. RHRLI is the only hair loss treatment center on Long Island that has this revolutionary hair loss treatment that uses robotic technology to give patients a full healthy head of hair. At RHRLI we know that ARTAS® is a life changing hair transplant procedure, but we also know you have questions about hair transplants and want to know your long term outlook after receiving the procedure. The answer is quite simple. RHRLI will provide you with a safe procedure that’s virtually painless and is safe. It’s also a permanent solution to your hair loss or thinning hair problem. And it will all be done with robotic precision. RHRLI’s Patient Advisor Michael Petroglia puts it succinctly, “The good news is that your hair transplant lasts forever,” he says. DHT stands for dihydrotestosterone and it plays a pivotal role in hair loss. According to the American Hair Loss Association, (AHLA) DHT is a byproduct of testosterone. Testosterone actually converts into DHT, while researchers still don’t completely understand the genetic process that leads to hair loss, it is known that DHT shrinks hair follicles. Areas that don’t have DHT or where DHT is repressed tends not to see hair loss. That’s why finding donor hairs in areas that are immune to DHT leads to a permanent solution to hair loss. 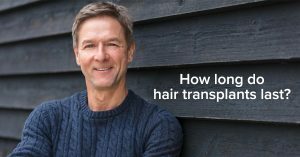 While the back and sides of the head are usually ideal for hair transplants, there are certain cases in which it’s harder to find donor hairs. One instance where this occurs is with patients who have alopecia areata. This is an issue in which a person’s immune system mistakenly attacks hair follicles, according to WebMD. Patients with alopecia areata usually see clumps of hair fall out. While it does usually grow back, about 10 percent of patients never see their hair regrow. “The good news about a hair transplant is that it lasts forever,” Petroglia says, but he adds with a smile, “The bad news about a hair transplant is that it lasts forever.” He points this out because you want to make certain to get your procedure done right. With the ARTAS® system, your transplant will be done with the aid of robotic technology that will identify donor hairs with precision and then transfer them with accuracy to give you a healthy head of hair. To schedule a consultation, contact RHRLI today.